Maeve is a Managing Director in the Higher Education Practice at McAllister & Quinn and has been with the firm since 2011. In her role as a Managing Director, Maeve has worked collaboratively with clients to secure over $20 million in external funding for a wide range of projects including student scholarships, faculty-led research, recruitment and retention initiatives, and curriculum development. She works strategically with clients to identify, pursue, and secure external funding that aligns with institutional priorities, managing all aspects of the application process from concept to final submission. Particular areas of focus include the National Science Foundation (NSF), Department of Education (ED), and the National Endowment for the Humanities (NEH). 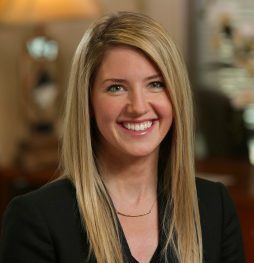 Prior to serving as a Managing Director, Maeve was a Director of Grants and Federal Affairs in the Higher Education Practice at McAllister & Quinn. Prior to that, Maeve was the Federal Grant and Foundation Research Analyst for the Higher Education Practice. In this capacity, Maeve supported the higher education team and its clients by conducting prospecting research and proactively contacting federal agencies to monitor and analyze federal funding trends. Maeve was also responsible for organizing and executing quarterly workshops for clients. Maeve initially joined McAllister & Quinn as a Higher Education Research Fellow. Maeve graduated with a bachelor of arts in journalism from the Grady College of Journalism and Mass Communication from the University of Georgia in Athens, GA. Maeve is from Atlanta, GA, and resides in Washington, DC.